Have you ever thought about changing the world... with cupcakes? Join She's the First and college students from around the nation in baking and selling tie-dye cupcakes to fundraise for girls’ education sponsorships in third world countries, where the majority of girls never graduate. She's the First is a wonderful organization started by young women to make a difference in the lives of girls from around the world. To help out with their national rainbow cupcake bake sale, form a team at your school, pick a date between November 1 and November 8 to host your sale, and sign up to be part of the movement. Not sure how to make the cupcakes? First, make the batter as the box instructs to. Then get out six bowls and separate the batter into each bowl as evenly as possible. Make one bowl red, the next orange, then yellow, green, blue and finally purple. Line your cupcake tins with liners and get out six different spoons. Starting with purple and add a small amount to the bottom of each liner, then add blue on top of that. It’s ok if the color doesn’t hit the edge of the liners after purple. Do not try and spread the batter to meet the edge, the colors will blend if you do that. Layer each color on top of each other until you reach red which will be your last and final color. Bake for 28-35 minutes. You will know they are done when you can stick a toothpick directly in the center and it comes out clean. When it’s done take the cupcakes out of the trays and let cool. If you are in a hurry, you can put them in the freezer and they should be cold within 10 minutes. When cooled it’s time to frost and decorate however you want. 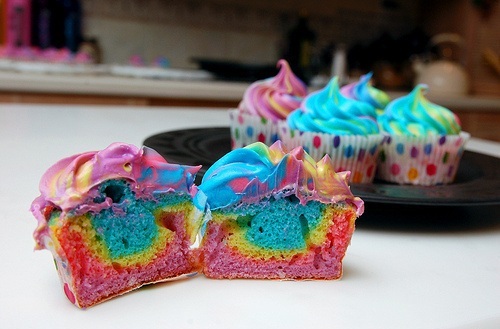 Rainbow cupcakes are not just for a good cause. These cupcakes are versatile because they can be tailored to any occasion. For St. Patrick’s day I did white, yellow and orange layers to represent Ireland’s flag. For Super Bowl season you could use the colors of the two competing teams. The possibilities are endless and if you’re really crunched for time, a cake is even easier to make. Have fun, get creative and you will definitely impress your friends and family with this recipe. They look so beautiful! I want to make these, what a great way to support a cause!!! Double thumbs up, Danielle! I made these today for the kids I volunteer with and they loved them. I found it was easier to just do little dollops the whole time than try to spread the purple. I top them with a funfetti icing and all the kids were really excited. I'll definitely be making these again. Thanks for the great recipe!